So lovely to be back here at Lulu Art for 2019… !! 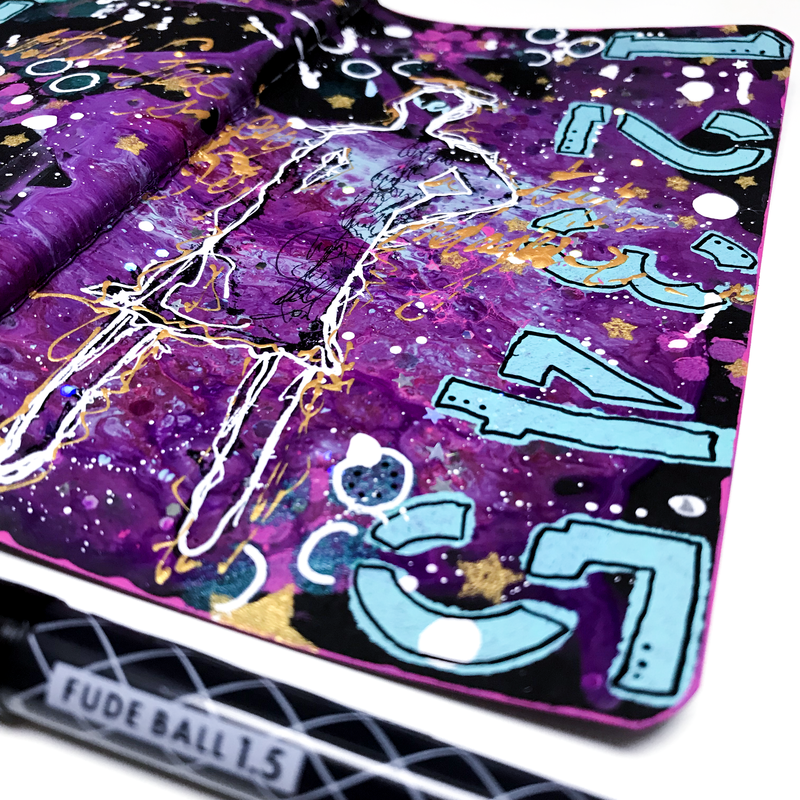 Back into my journal again… and you know I love to splash the paint around in there! So… considering that I will be working closely with the “Art by Marlene” brand this year and Lulu Art stocks such a wide range of her lovely products, I thought I would grab one of her stencils, and a couple of Studio Light stamps in her range and see where we end up. Using Dina Wakley heavy body acrylics in cheddar, eggplant, fuschia and turquosie I set to working up a background. Then with these two stamps, I created this little story. 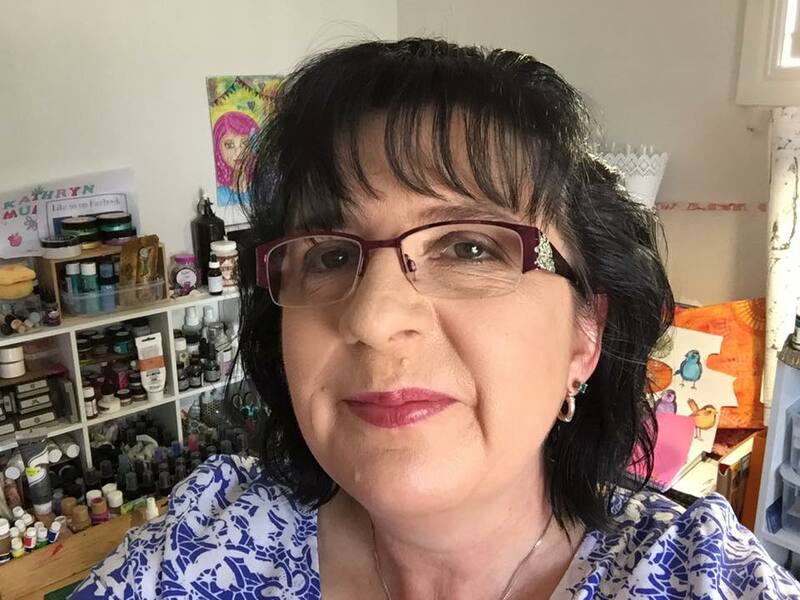 Well hello Lulu Art fans, today I’m going to play with something new, Dina Wakley Pouring Medium – it’s fun and a little scary and my friend Kylie who owns Lulu Art, thinks I’m about to make a huge mess, she might just be right (though I hope not)! 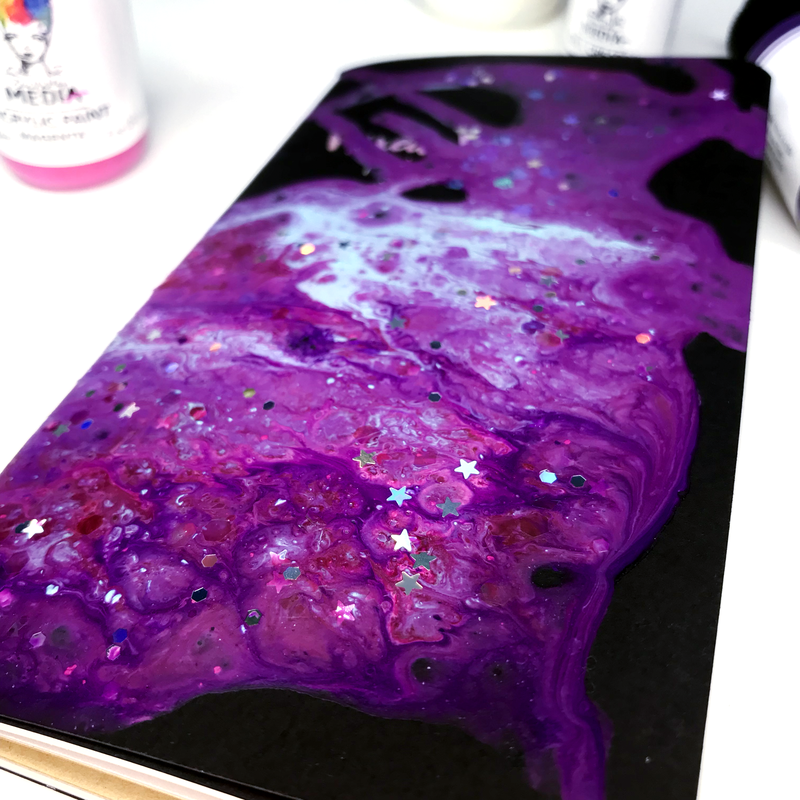 Pouring Medium is an acrylic medium that you mix with Dina Wakley acrylic paint (or any acrylic paint really). This mixture becomes a pourable, fluid paint that you play with to create interesting effects. To help you create cells in your pours, we also created Cell Creator. 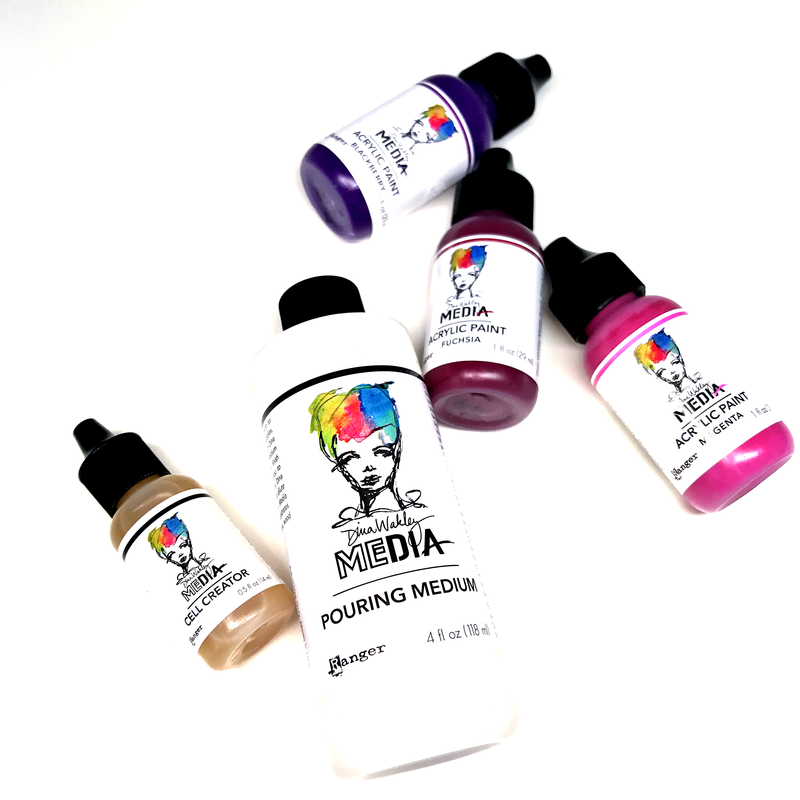 Just a few drops in your pour mixtures creates serious MAGIC! So how do you use Pouring Medium and Cell Creator? Start by adding a little Dina Wakley paint into a small mixing bowl or cup – use a different bowl for each color. I think perhaps limit the colors to 5-7 different colors to begin – just so you don’t make a really big mess! Once happy with your design leave it to dry. Drying time depends on your climate, more humidity means a longer drying time – give it at least 24 hours. For my mixed media journal cover, I also created a little combination of Lindy’s Magicals mixed with water and Pouring medium and added this to the mix (next time I would NOT add any water to this as it made it too runny) and I also added some glitter – again I wouldn’t add this to a colored pour as it got lost – looked way better sprinkled over the top. 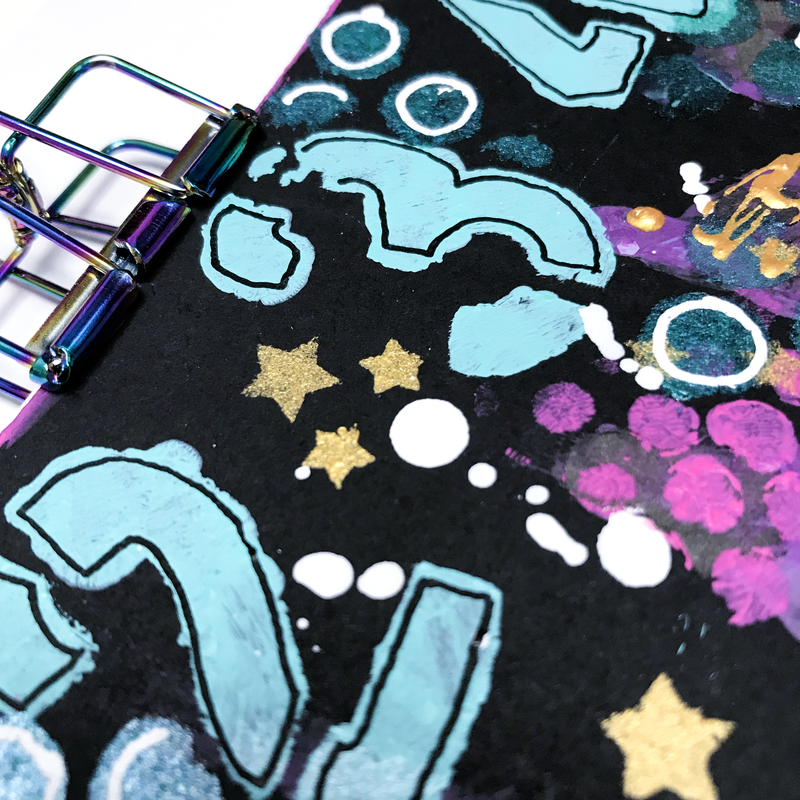 To finish off the journal cover I’ve added stamped images and then embellished with paint pens and stenciled images and a few paint drips – keeping it simple! 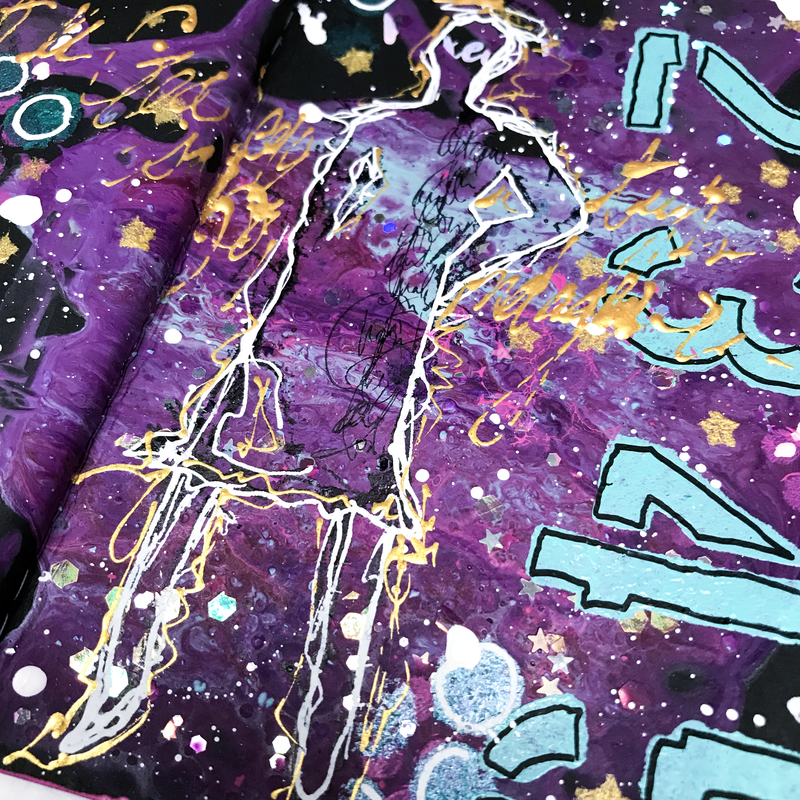 I’ve created a video so you can watch my little experiment and see how I finished off my journal cover just in case you might like to try something similar. The pouring medium dries to a satin finish, though depending on the acrylic paint you’ve used it can turn out quite matt. The fresher your Dina Wakley Media acrylic paints are, the more easily they will mix into the pouring medium. Either way, just keep mixing until your pouring mixture looks consistent – you’ve got lumps, keep stirring! What can you pour on? Well, almost anything including plywood board, canvas, paper, wood, plastic, glass, metal, cardboard, and even aluminum foil! Not sure what to use your pour for? 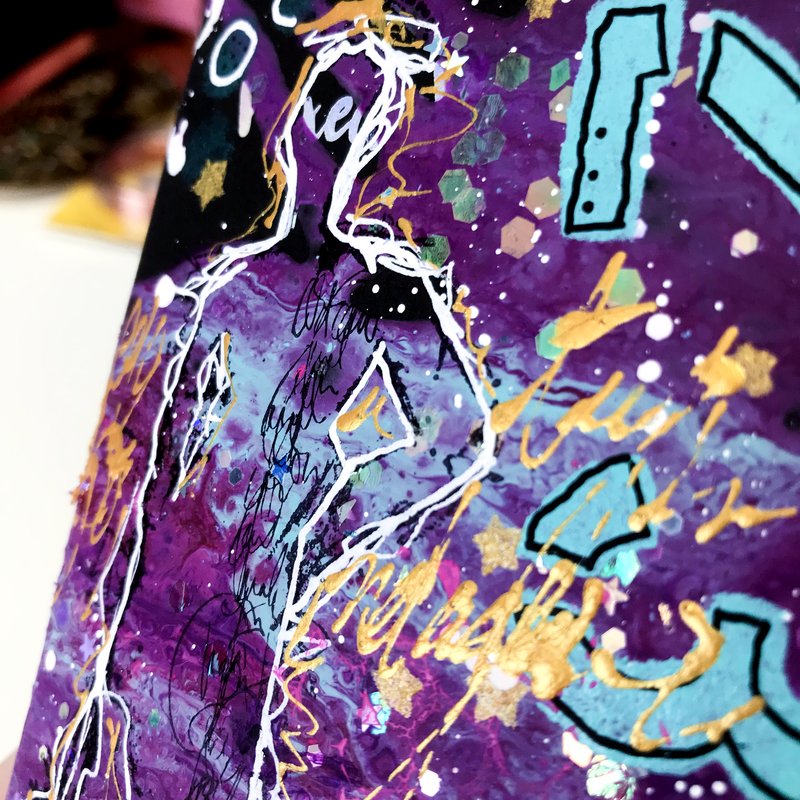 Think about canvas, book covers, collage papers, backgrounds, journals, and because the surface is matt you can paint over them or even draw on top! I hope my little experiment inspires you to have a play with this for yourself, I promise the most nerve-wracking part is lifting the cup! So grab some of the Dina Wakley Pouring Medium and see what you can create! Hi there, this month I am sharing one of my favourite quotes with you. “Life is what happens to you when you are busy making other plans”. I am sure this will resonate with a lot of you. We have already hit August, where has the year gone!!! 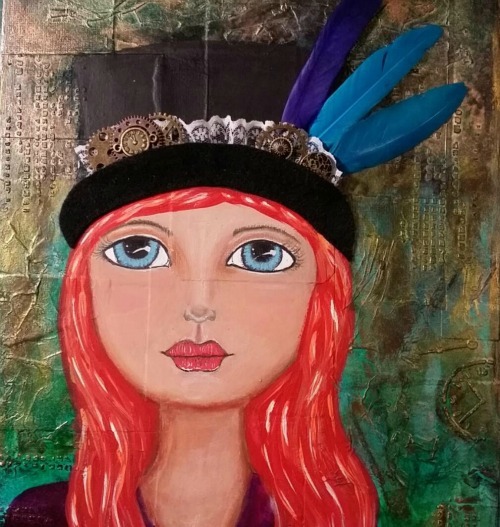 Hope you enjoy this mixed media art journal page that I have put together for you all. Watch the video to see how it all came together. I trust you all had a fabulous Easter. I know I really enjoyed my time away from work and spending some quality time with my family. I made a mixed media tag for this months project and really enjoyed working small for a change. Although, I have worked on tags before it has been a while. To me these are like doing a mini art journal page and as always there are no rules as to what you can and can’t do. I hope you enjoy watching my video and I would love to hear what you think and if I inspired you what did you do with that inspiration. 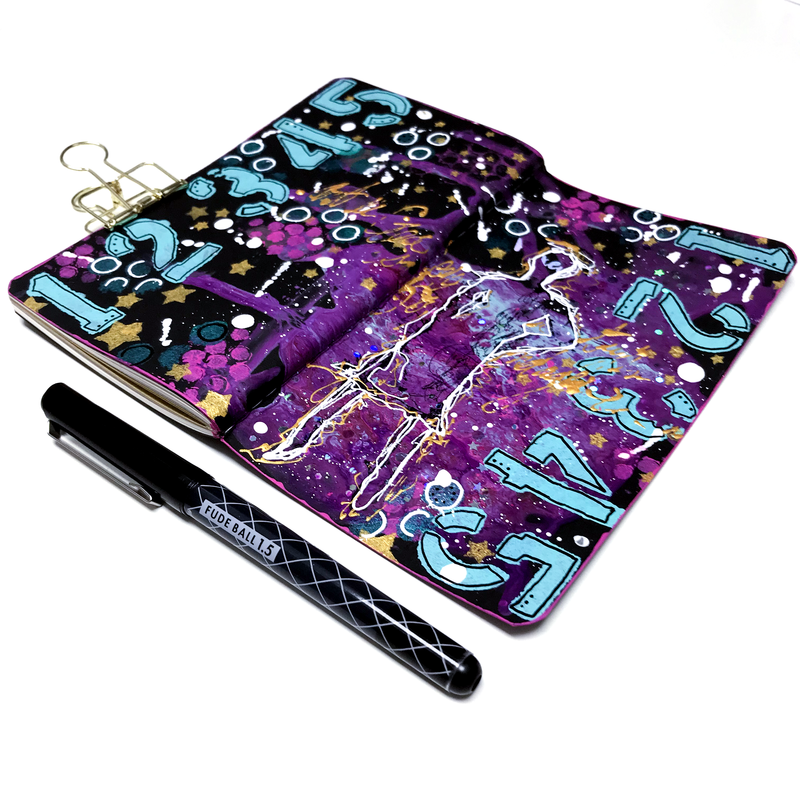 Last month I had one lovely lady share with me her Dylusions journal cover which she did after watching my video. It was really great to see what she did and I love that she shared it with me. Hello there lovelies, Kathryn here. I hope you are having a wonderful year so far. I’m absolutely loving seeing everyones Colour Me Positive challenge pages in the facebook group. It’s so wonderful to see everyone having so much fun and sharing their pages. The support and encouragement everyone gives is heart warming and fantastic to see. It’s Design Team project time and I decided it was time to do something on my Dylusions Art Journal cover. I had some crazy fun with this project and I am very surprised and pleased with the results. Mind you the end result is not even close to what I had planned but I absolutely love it anyway. I hope you enjoy watching my video and would love to hear what you think.